Just under a month after Fox Searchlight's The Shape of Water won Best Picture at the 90th Oscars, director Guillermo del Toro has signed a new overall deal with the studio, making it his new production home. The overall deal will not only cover projects that will be written, produced and/or directed by the filmmaker, it will also include the creation of a new genre label within Fox Searchlight, which will be the new home for horror, sci-fi and fantasy projects at the studio, including projects that del Toro himself will produce and/or curate. Here's what Guillermo del Toro had to say in a statement, where he thanked Fox Searchlight Pictures presidents Stephen Gilula and Nancy Utley, along with the studio's co-heads of production, David Greenbaum and Matthew Greenfield. "For the longest time, I've hoped to find an environment in which I can distribute, nurture and produce new voices in smart, inventive genre films and channel my own. In Fox Searchlight, I've found a real home for live action production, a partnership based on hard work, understanding of each other and, above all, faith. After the wonderful experience I had with Fox Searchlight on The Shape of Water, I am honored to have the opportunity to continue the relationship. I am more than grateful to Nancy, Steve, David and Matthew for their trust in me and for joining me on this adventure." Films that are developed through this new division, which has yet to be given an official name, will be financed, marketed and distributed by Fox Searchlight Pictures. The first project that will move forward through this division will be entitled Antlers, directed by Scott Cooper (Hostiles) from a script by Nick Antosca (The Forest) and Henry Chaisson, based on Nick Antosca's short story "The Quiet Boy." Guillermo Del Toro will serve as a producer alongside David Goyer and J. Miles Dale, with Kevin Turen serving as executive producer. Here's what Fox Searchlight Pictures presidents Stephen Gilula and Nancy Utley said in a joint statement. 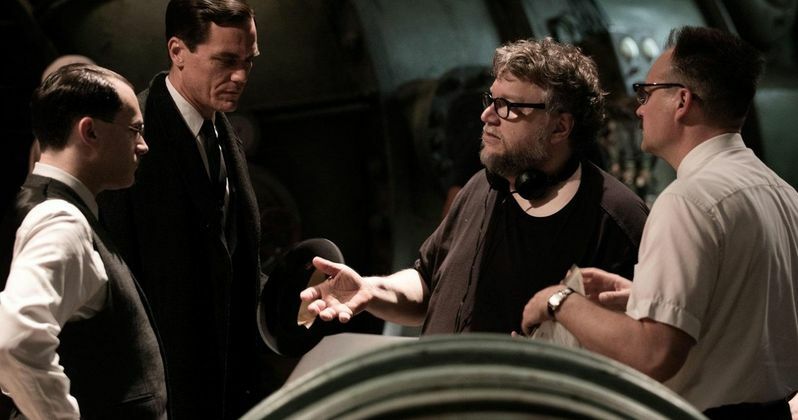 "Throughout the process of The Shape of Water coming to life, we have observed first-hand Guillermo at work as a director, a writer, a producer, a creator. We believe in him and the vision for a new Searchlight label and we are eager to embark on this journey with him." The Shape of Water was nominated for 13 Oscars, the most of any film, and it ended up winning four, Best Picture, Best Director (Guillermo del Toro), Best Original Score (Alexandre Desplat) and Best Production Design (Paul D. Austerberry, Shane Vieau and Jeffrey A. Melvin). The Shape of Water became one of the rare movies with sci-fi and/or horror elements to win the top prize, and it was also the first Best Picture winner centering on a female character since Million Dollar Baby in 2004. Here's what Fox Searchlight's co-heads of production, David Greenbaum and Matthew Greenfield said in their statement. "As well as being a brilliant filmmaker, Guillermo is a passionate collaborator, curator and advocate for other artists. Working with him on this new label, focused on the highest quality projects in the genre space, allows Searchlight to expand our reach to new filmmakers and new audiences around the world." The Shape of Water took home over 100 awards in total, including the Golden Lion at the Venice Film Festival and appeared on over 70 of the nation's critics lists of the top films of 2017. After getting his start as a special effects makeup artist, Guillermo del Toro first burst on the scene with his 1993 directorial debut Cronos, which he followed up with Mimic, The Devil's Backbone, Blade II, Hellboy, Pan's Labyrinth, which won three Academy Awards, Hellboy II: The Golden Army, Pacific Rim and Crimson Peak. Fox Searchlight Pictures did not announce any casting for Antlers yet, and there is no indication as to when production may start, or when the studio may release this project in theaters. Will The Shape of Water Sweep the 2018 Oscars?